Actually, if the goal pursued by Turkey might have been rather clear when the AKP first took over the power, the discrepancies within the Turkish government gradually made it quite puzzling. Since Ahmet Davutoglu started shaping his country’s foreign policy, he has claimed to implement a neo-Ottoman vision. Basically, this renewed imperialism considers that any area that was once encompassed by the Ottoman Empire must “enjoy” a privileged relationship with Turkey. Therefore, Turkey tried to appease the problems it has with most of its neighbors – the tentative improvement of its relation with Armenia having been a kind of failed litmus test – and even to intervene as an “honest broker” aiming at solving regional disputes through its supposed Ottoman-old regional knowledge. Turkey actually and successively – if not successfully – imagined mediating Israel and the Palestinian authority, Israel and Syria, Armenia and Azerbaijan or even Lybia and the West. However, Islamism is another deep trend of the new Turkish regime when compared to the old Kemalist elite. In this regard, since 2002, the AKP government has progressively radicalized its positions. If it tried to put forward the misleading wording of “moderate Islamism” at the beginning, it increasingly proved to be more and more radical, a tendency that was fostered both by its failure to access to the EU and by the intrinsic social evolution of Turkey’s population, two processes that fed each other. Thus the Davos episode, the Mavi Marmara operation, the strengthening of its relation with the Hamas or, more globally, Israeli-bashing are policies implemented by Erdogan both to change Turkey’s image in the predominantly-Muslim Arabic world and to please its home constituency. In this respect, the recent advocacy by Mahmud Abbas for the recognition of the Palestinian State by the UN is one of the landmarks targeted by this policy and actually, Erdogan is seen as a heroic and charismatic leader by a large fraction of the Arabic peoples. Clearly, both visions stem from the usual strong Turkish nationalism, as was the case for Kemalism, and they are both supported by Turkey’s impressive economic record however fragile the ground of this economic growth may be. Nevertheless, Erdogan’s and Davutoglu’s Ottoman daydreams for Turkey are probably quite different: the former – sometime nicknamed the Caliph of Istanbul or the Padishah – probably imagines a kind of Islamic empire centered on and ruled by Turkey whereas the latter rather thinks of Turkey as a mini-superpower with its feudal influence zone. The net result of these competing visions is the apparent inconsistency of Turkey’s foreign policy, and more than this supposed inconsistency, its limits. From 2002 to now, Turkey successively turned its attention to the EU, Russia and Eurasia in the aftermath of the Georgian conflict and to the Middle East since the Davos row. Actually, as relations with the West were cooling down because of the EU prospect’s fading away and of the renewed Islamic trend of its society, Turkey embarked upon a kind of energetic flirt with Russia before realizing that, while Moscow could clearly take advantage from this momentum, it was mainly a trap regarding its own emancipation dream: Ankara depends already on Russia for most of its gas and for a sizeable part of its oil. Moreover, incentives of a role in South Caucasus or of a path through Central Asia though South Caucasus appeared to be mainly illusive given the Russian control on these areas. Turkey and Iran: past or future honeymoon ? Therefore, Turkey started to heat up its relationships with the Muslim world, notably with Syria, with the Hamas and with their common suzerain Iran with which it boosted its economic exchanges and, as a side effect, a renewed collaboration against PKK/PJAK. The degradation of its “strategic partnership” with Israel naturally comes along with this new orientation. However, the initial support given to Gaddafi and Assad, respectively in Libya and Syria, the subsequent about-faces in these two countries after a very opportunistic feeling of wind change, just cast a serious shadow on the Turkish commitment toward the Islamic-tinted revolutions. Some other signals seem to indicate that the so-called realignment of Turkey may just be a posture: for instance Ankara’s recent agreement to host anti-missile radars on the eastern part of its territory, i.e. directly against Iran, strongly displeased Tehran but also Moscow. Likewise Erdogan’s recent speech in Cairo was quite ambiguous as, on the one hand, he implicitly reiterated his threats against Israel and his Islamist orientation, mentioning “when we look at the region, we will find that Saudi Arabia, Iran, Egypt and Turkey are the most important countries. For this reason, there has to be some sort of cooperation among these nations”; but on the other hand, he recommended “a secular constitution for Egypt”, saying “do not fear secularism because it does not mean being an enemy of religion. I hope the new regime in Egypt will be secular. I hope that after these remarks of mine the way the Egyptian people look at secularism will change”. Those who admire Erdogan will probably term this borderline posture as clever whereas the others will find it confusing. Whatever its intent, the actual outcome of this diplomacy is the increased mistrust with which various players – from the US to the Hamas, from Iran to the EU and Russia – are now considering Turkey. The mere fact that Davutoglu had recently to hammer home that the “no problem with neighbors” policy is successful demonstrates how dubious this affirmation is. However, if we put aside both Erdogan’s gesticulations and the apparent contradictions of Ankara’s diplomacy, we must recognize that Turkey succeeded in reaching the “strategic depth” aimed by Davutoglu. His country is no more under US dominance and it is actually uncontrolled and uncontrollable. As a crazy weathercock, this Turkey could be equally a threat for Iran, for Israel, for Syria, for Armenia and for Europe, as shown by the recent menaces sent to Cyprus over the Mediterranean drills. Therefore, in this inflammable region, Western leaders would be well-advised to avoid conferring any mediation role to Turkey because it could be both ineffective – Turkey is not necessarily seen anymore as a reliable partner by other Muslim countries – and dangerous as it would benefit only to the reinforcement of this changeable country. By contrast, we should work to directly appease the Middle-East by enforcing a true democratization in Arabic countries and, eventually, by endowing Palestinians with a true State whatever Israel’s apprehension. After all, Turkey’s regional strength mainly results from the absence of a true democratic Arab leadership and from the unacceptable nature of the current Iranian regime. And the way Turkey is challenging the West is bolder, deeper and smarter than Iran’s one. In the event of Ahmadinejad’s fall, the West could even advantageously envisage swapping Iran and Turkey in its strategic game. This may sound like science-fiction. It is not: A few years ago, Ralph Peters, a retired US officer close to the Intelligence services, published an article entitled “Blood borders: How a better Middle East would look”. In this much commented paper, he made a hypothetical redrawing of the Middle-East’s boundaries. With no surprise, he granted Palestine and the Kurds with a State and he partially granted back Armenia with its Western territories thus limiting Turkey’s harmful influence. Apparently, from now on, the West must make a habit of not thinking of Turkey in terms of solution but in terms of problems. A “privilege” which is variously felt by its recipients. According to cable ANKARA 00000087 005 OF 006 disclosed by Wikileaks, Ambassador Jeffrey noted that “Finally, not all of the ex-Ottomans look with fondness on their past under the Pashas, or yearn for Turkey's return”. For a quite comprehensive analysis of the first cables series disclosed by Wikileaks on Turkey, read (in French) “les fuites américaines mouillent la Turquie”, Eurotopie, January 2011. The fundamentals of Turkey’s economy are variously appraised. See for instance “Instant obsolescence of the Turkish model”, Asia Times, August 2011. Not to speak about the difference of personality. Read “les fuites américaines mouillent la Turquie”, Eurotopie, January 2011. A position than has just been restated by Turkey despite the recent cold with Iran. 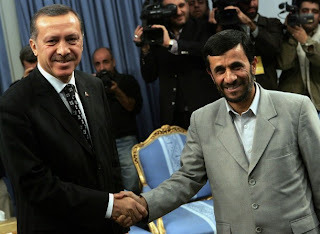 Read “Erdogan Reiterates Turkey-Iran Cooperation in War on Terrorism”, Fars News Agency, 09/27/2011. “Turkey's Davutoglu says zero problems foreign policy successful”, Today’s Zaman, 09/18/2011. Armed Forces Journal. The maps published in this article are now available on Wikipedia.